"Yet even with middling hardware and a brand new version 1. "0 Microsoft OS that is clearly lacking the maturity of iOS or Android, it's simply hard to resist this sleek little lightweight gem of a handset running a very promising -- and dare we say fun -- take on the mobile OS experience. Try as we might, we can't put it down even though we have an iPhone 4 and Galaxy S at our immediate disposal. 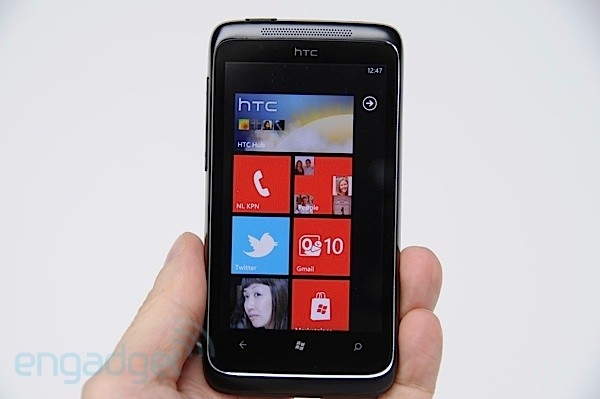 The HTC Trophy may not be our smartphone champ but it's definitely a winner." 480 x 800 pixel resolution capacitive screen measuring 3.8"
While not all that different in spec from most of the Windows Phone 7 handsets that have already made their way to market, it is the total packaging of construction quality, feel, performance, custom HTC apps, and, well, the total user experience, that tipped his impression to the favorable category. It's a nice review of a phone that may just be the sweet spot for a number of potential purchasers. Nice review. I had the same choice as mentioned at the end: LG Optimus 7 or HTC trophy and as the reviewer I oppted for the LG Optimus 7 because of the better build / high qualitity feeling, increased storage, higher capacity batterie, narrower form factor (feals more phone-like in my hands and is easily pocketable) and the hardware buttons. The screen of the optimus is just normal LCD which results in a not so good viewing angle but it is very bright and I liked it more than the Trophy's when comparing it in a shop (unfortunatly i hadn't a chance of comparing them in direct sunlight). I also like the responsiveness of the LG's screen. So far I must say that LG with Widows Phone 7 is a great phone - infact the best (at lest most fun ) I've had so far. What isn't so great (hardware wise) is the camera (especially for indoor shots of people with its flash - but I really don't know if other phone cameras are that much better and I might be spoiled by my "real" camera).